The below information serves as an introduction of sorts to a full and detailed chapter about President Lee’s special witness of Jesus as found in my forthcoming (September) book, I Know He Lives: How 13 Special Witnesses came to Know Jesus Christ. 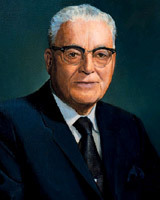 President Harold B. Lee only served as President of the Church for a year and a half before he unexpectedly passed away right after Christmas in 1972. He did, however, spend a long and productive ministerial term as an Apostle. In my researches, I have found it interesting that a number of younger apostles, men who became his protégés, always spoke of him with the highest regard. Later leaders like Boyd K. Packer, Marion G. Romney, Bruce R. McConkie, and others of the Twelve referred to their mentor with the highest esteem and regard. They spoke of him as one of the greatest teachers of this dispensation. They also spoke of him as a prophet and seer possessing the Holy Spirit in great measure. Further, President Lee seemed to recognize that one could teach by sharing spiritual experiences without necessarily casting pearls before swine. He was not of the school of thought that nothing sacred could ever be shared with others; in fact, he constantly did so as a means of strengthening the faith of others and bearing testimony that God is active in the lives of those who want Him to be. President Lee started with humble beginnings as a farm boy, and then progressed through education and natural talent to become one of the greatest men alive. As explained in the chapter on President Lee in my forthcoming book, he received his special witness through spiritual experiences throughout his life. One of them was his call to oversee the church welfare program during the great depression. Another came shortly after his call to the Twelve, when the Spirit gave him absolute knowledge that Jesus’s ministry as recorded in the scriptures was real and more than that, He was resurrected and still lives today. Elder Harold B. Lee was influenced by President Heber J. Grant, who often spoke with caution about the pride that could enter the heart of a man who had been blessed to see a vision of Jesus. He had seen that pride grow in some and lead them to a spiritual downfall. Elder Lee mentioned President Grant’s worries in this regard and they became his own. Thereafter he emphasized the important of the Spirit of the Lord as the means of receiving unshakable conviction over that of seeking for visions or personal appearances. Having noted such, which is much better explained and reviewed in his chapter in my forthcoming book, it is also true that President Lee could testify of his own marvelous special witness as one who knew as one who had seen. It seems that the Lord may choose to reveal himself to those who love and serve Him and keep his commandments, even if such a blessing is not requested. As noted, further information about President Lee’s special witness will soon be available in I Know He Lives: How 13 Special Witnesses came to Know Jesus Christ.